Learn how to crochet with beads. Discover free bead crochet tutorials, free beaded crochet patterns, and step-by-step beadwork instructions. Beaded Crochet Examples. Beaded Crochet Samples - Photo © 2009 Amy Solovay, Licensed to About.com, Inc. Here is a free tutorial for an easy beaded crochet technique. You can use this technique to make a single row of crocheted beadwork. 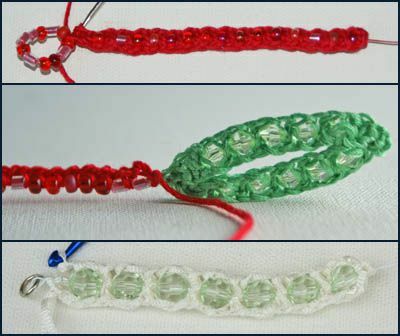 This technique is useful for making beaded crochet motifs such as snowflakes, apples, and hearts. It is also useful for making beaded crochet jewelry, including necklaces, bracelets, and chokers. Beads and wire are an amazing combination, especially when you crochet them into beautiful jewelry. Here's your opportunity to grab 7 different patterns for making bead and wire necklaces. You're invited visit our main index of free crochet patterns with beads. This page features a photograph of each completed project, along with links that take you to the free patterns. You'll find free patterns for beaded motifs, beaded crochet jewelry, beaded bags, and more. At Beadline.com: Beaded crochet rope instructions by Judith Bertoglio-Giffin.